The Sol Mate Vibrasonic Mole & Gopher Chaser repels unwanted burrowing rodents with the strongest and least expensive power available – the sun. Solar-powered and maintenance-free, the Sol Mate Vibrasonic Mole & Gopher Chaser uses state-of-the-art technology to repel moles, gophers, voles, shrews and other destructive burrowing rodents. This ingenious device is environmentally friendly and eliminates the use of poisons and traps around children and pets. Since one full charge yields up to 4 days of trouble-free power, the unit is capable of operating without interruption even in unfavorable weather. 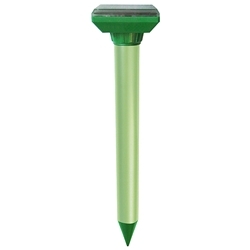 The solar panel is embedded in a watertight ABS plastic housing with unique mow-over design while the spike is made from corrosion resistant aluminum. The rechargeable batteries are replaceable insuring years of rodent-free gardening. The Sol Mate Vibrasonic Mole & Gopher Chaser features a patent pending motor drive that generates powerful vibrations that, though harmless to pets and humans, are irritating to rodents. Intermittent emissions minimize the chance that rodents will become immune to the effect. Provides up to 13,500 square feet (1/3 acre) of coverage. Moles, voles, shrews, gophers and other destructive burrowing rodents "can't hide anymore." Dimensions: 12 1/2"; X 3 1/8"